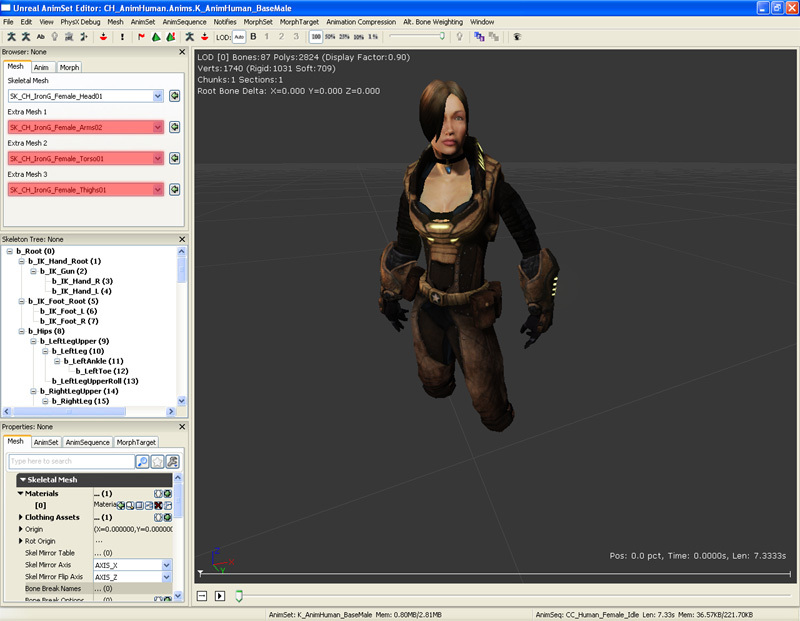 Many games these days allow players to customize the appearance of their virtual avatar. While attachments via sockets or bones work great for non animating or separate animating visuals; they don't work so well when you want the virtual avatar to move as a single entity. For example, imagine if you wanted to allow the player to create an avatar from a selection of shirts and pants. Because these parts when composed together form a humanoid, it will look very unrealistic when the animations do not synchronize appropriately. 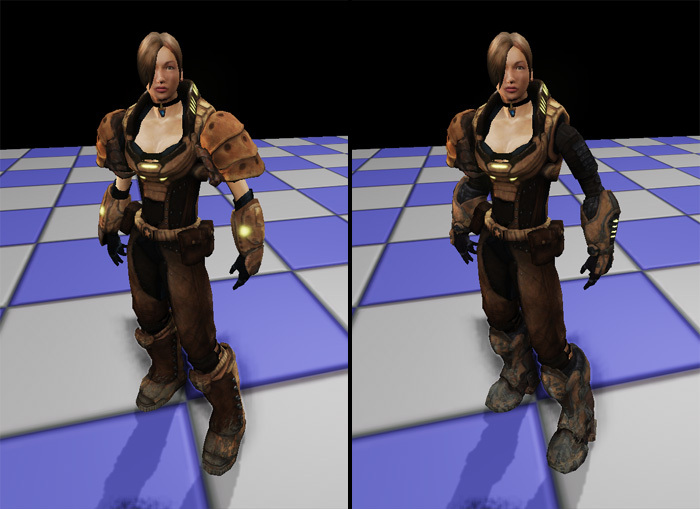 In this example, we have Lauryn with a different shoulder pad arrangement, different boots and different arms. Shadows and animations work automatically with very little fuss. There are two methods to achieving this effect. Multiple skeletal mesh components per actor - This method is the most flexible as it allows run time changes to the skeletal mesh. However it can affect performance as each skeletal mesh actor will be an additional draw call. Compositing meshes (Licensees only) - This method composites the mesh to generate a single mesh from multiple meshes. This method won't be described in this gem. This is the modular pawn class which defines multiple skeletal mesh components. Each skeletal mesh component represents a part of the pawn which can be swapped out for another part. Only one skeletal mesh component is the parent skeletal mesh component, which is the head skeletal mesh component in this case. The parent skeletal mesh component is responsible for calculating the skeleton animation data which is used by all of its child skeletal mesh components. All child skeletal mesh components also receive all translation, rotation and scale data from their parent too. For best results, ensure that all skeletal meshes use the same skeleton and are designed for the same animations. All the vertices should be mapped directly to the skeleton as there is no need to recenter each skeletal mesh before exporting. Lastly, all child skeletal mesh components have their shadow parent set to the same parent skeletal mesh component. This produces better performance when rendering dynamic shadows and prevents shadow overlapping problems. // Skeletal mesh which represents the head. Parent skeletal mesh component. // Skeletal mesh which represents the torso. Child to the head skeletal mesh component. // Skeletal mesh which represents the arms. Child to the head skeletal mesh component. // Skeletal mesh which represents the thighs. Child to the head skeletal mesh component. // Skeletal mesh which represents the boots. Child to the head skeletal mesh component. // Skeletal mesh which represents the left shoulder pad. Child to the head skeletal mesh component. // Skeletal mesh which represents the right shoulder pad. Child to the head skeletal mesh component. // the pawn animates as if it was one skeletal mesh component. // the rendering of the shadow for this pawn and to prevent shadow overlaps from occur. In the class above, an Anim Node Sequence was defined to allow you to test animations. This will stop the anim tree from working normally, thus remove the Anim Node Sequence from the class script or object (within an archetype) to get the anim tree working again. After placing a ModularPawn into the world, opening up its properties window will reveal all of the skeletal meshes. Expand each skeletal mesh object and set the skeletal mesh appropriately. The parent skeletal mesh component should have the Anim Tree Template, Physics Asset, AnimSets set. In this case, the Head Skeletal Mesh object would have all of these. As you set each skeletal mesh, they will appear in the editor. 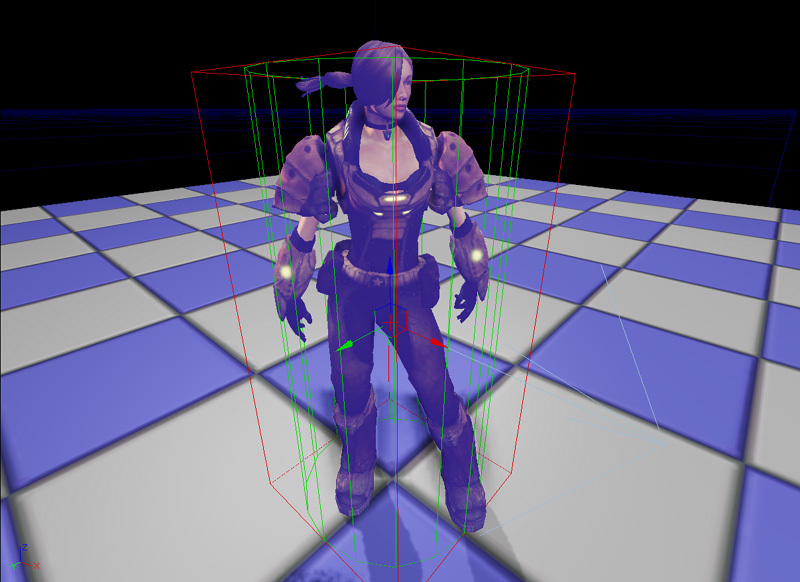 The parent skeletal mesh component (Head Skeletal Mesh) has an Anim Node Sequence set to the Animations object. Expanding the Animations tab to reveal the Anim Node Sequence. Assign the Anim Seq Name to an animation that can found within the Anim Sets array. 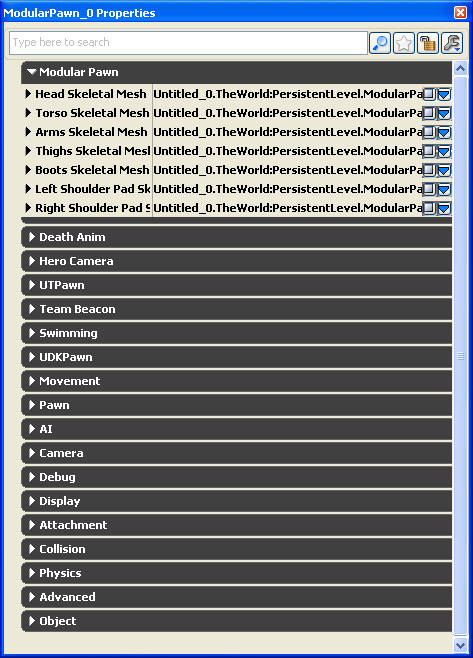 This will update the skeletal mesh components within the editor. To visualize the animations, run PIE. The parent skeletal mesh component (Head Skeletal Mesh) translation, rotation and scale affect the child skeletal mesh components. Adjust these if you find that the skeletal mesh components don't fit within the collision cylinder, or the skeletal mesh components aren't in the right orientation relative to the pawn rotation, or if the skeletal mesh components are too small. You can also adjust the child skeletal mesh component versions of these; just remember that these are relative to the parent's settings. If you wish to visualize the modular pawn without having to run PIE, you can do this within the Unreal AnimSet Editor. By setting the "Extra Mesh #" fields (highlighted by the red fields), you can assign multiple meshes to the same skeleton and animations. 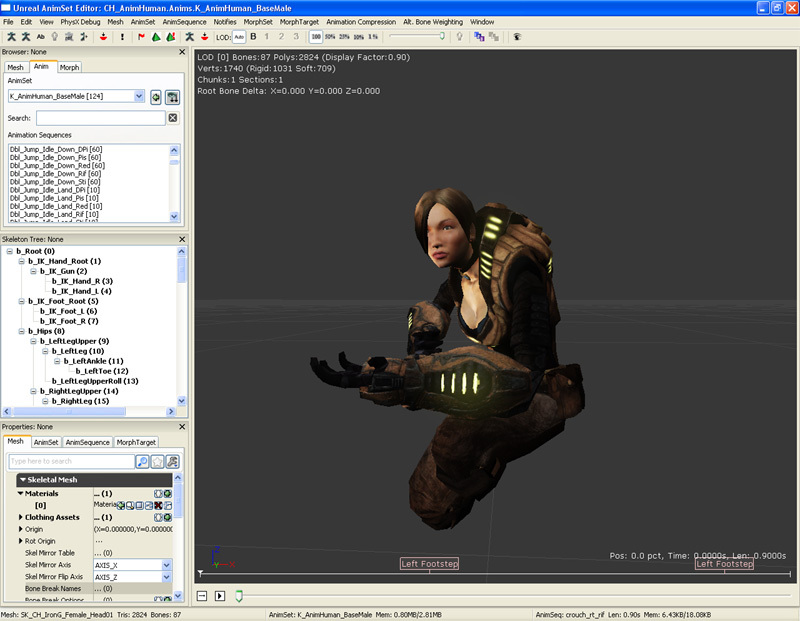 In this example, most of Lauryn's meshes were assigned. However there weren't quite enough slots to assign the boots. After you have set the extra meshes, click on the Anim tab to display the list of animations. Select any animation and play it. You should see all of the skeletal meshes animating. There is another way to attach things onto skeletal meshes and that is by using socket attachments. So, the question is, when do you use socket attachment and this method? The answer is when you need animations to synchronize. In this particular case, the meshes all need to synchronize in order to look like a pawn. The shoulder pads could be done via socket attachments however.